Theoretical and empirical contributions to the understanding of communicative interactions between heterospecifics are scarce and tend to apply a monological model of communication that focuses on the transfer of information from signallers to receivers. This study relies on an alternative model of communication, semiotic alignment, which sees communicative interaction as a dialogical process of joint semiosis resulting in the alignment of the interactants’ own-worlds (Umwelten). We conducted an experiment where dyads composed of an elephant instruction-giver and a human instruction-receiver needed to engage in dynamic and interactive communication in order to solve a cooperative object-choice task. Our results showed that dyads were able to solve the task well above chance levels. Moreover, cross-recurrence analysis revealed that interactants were synchronizing referential indexical gestures (pointing with a limb) throughout the experiment. However, we were not able to confirm a direct correlation between joint deixis and experimental outcomes, presumably because these outcomes are dependent on other forms of joint semiosis not analysed in this study. The online version of this article ( https://doi.org/10.1007/s12304-019-09354-y) contains supplementary material, which is available to authorized users. This project has been supported by grant 611A10017 from Mae Fah Luang University’s 2017-2018 Researcher Fund (FY 201). I wish to thank the undergraduate students who participated in the experiment as well as my research assistant and the Karen mahouts who helped in setting up and conducting the experiment. Also, my thanks to the Ban Ruammit Karen Elephant Camp staff for their support in carrying out the experiment. 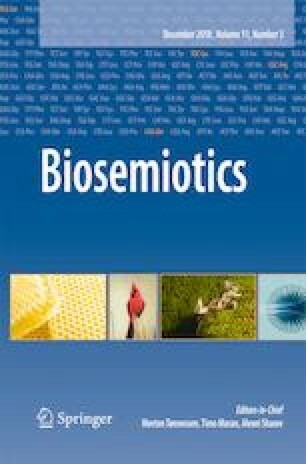 Thanks also to the anonymous reviewers and the editors of Biosemiotics who contributed with their valuable criticism to improve the final paper. Finally, a special thanks to the elephant Chumpon, whose patience and amiability greatly contributed to the smooth running of the experiment. Poole, J. H., & Granli, P. K. (2009). ElelphantVoices gestures database. Retrieved from http://www.elephantvoices.org/. Accessed 25 Sept 2018.